Galivantes started as an DIY promotions co-op between friends Rachele & Craig. After a while of putting on gypsy ska punk bands and electroswing DJs they missed performing themselves. As both their bands were based outside Manchester they decided to start a new band. The main aim was to have fun and adventures. Hence the unicorn. Along the way they collected more friends, charmed to join them on their musical adventure. Along came Jam on bass, Stringy on drums, Andy Speak on Accordion, Dave on Trombone and Abbi on Percussion. After a few shaky gigs they soon found their feet playing a mix of bouncy punky reggae gypsy ska honed with their daily observations of life in general and a subliminal power to the people message. Described by some as a UK cross between Sublime and The Pixies their message is "If there is gonna be a (non-violent) revolution, there needs to be a soundtrack." 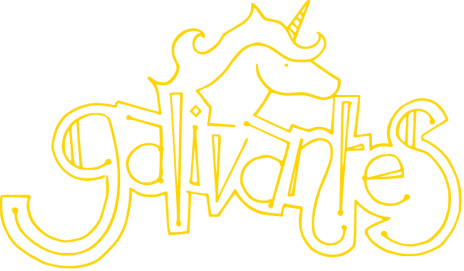 Only going for a year, Galivantes have performed alongside Honeyfeet, Rubber Duck Orchestra, China Shop Bull and Hackney Colliery Band, be resident band for Manchester club night Swing & Shout and have played gigs in Manchester, London and Sheffield. They were also lucky enough to perform at the launch party of HOME mcr organised by Danny Boyle and a whole summer of festivals including Kendal Calling, Dirty Weekender, Holifair and Audiofarm.